Hey everyone. It’s been a while since my last reveal and I am officially caught up (meaning my current reveals are projects I just finished up - nothing banked anymore). Up next, a commission I made for a friend who had a gap in his 90’s Marvel Legends collection he needed filled. 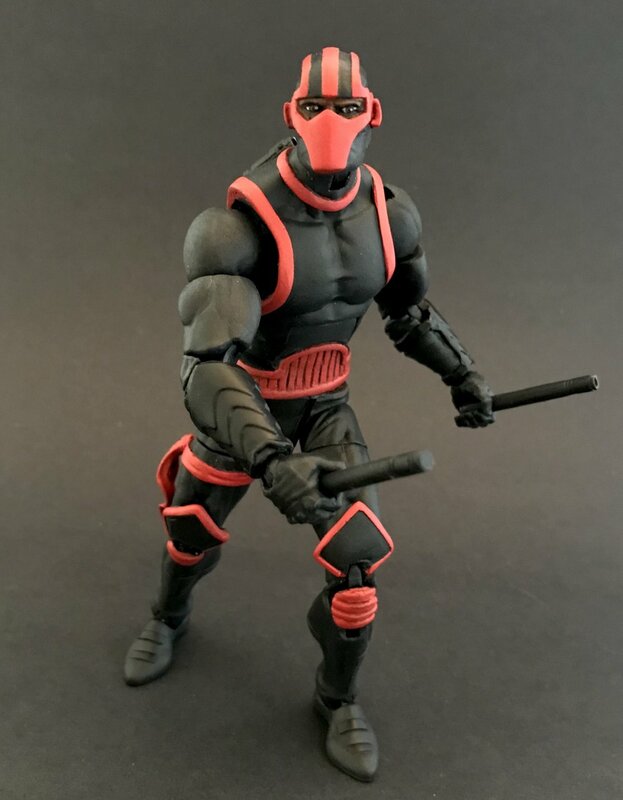 Check out my New Warriors Night Thrasher! Night Thrasher was made using a Spider Man UK torso, Cosmic Spider upper arms and legs, Netflix Daredevil lower arms, hands, batons and baton holder and a cast of Fantomex’s head. The ribbons hanging off his leg are from a Rogue head. I originally planned on using a Cosmic Spider Man torso as well (I realize it is the same as the UK torso i ended up using), but when i heated it up to take the figure apart, the chest cavity caved in on itself somehow. I never had that happen before. It was very frustrating because I had to redo all the prep work on the torso, which was pretty investing. There was a decent amount of sculpting on this guy. Majority of it was done using Apoxie Sculpt. I sculpted details on the torso (around the shoulders, neck and the abdomen.) I also sculpted the sash around the leg, details on the feet, crotch and the head and filled in the peg holes on the figure. I used Procreate to make the knee pads (or whatever you call those things) so they would be more durable in case of a shelf dive. The paint job on this guy was fairly simple. I used a black Citadel Spray Paint for the majority of it. I did a very subtle charcoal grey over spray on the entire figure to add some depth, however I don’t think its that noticeable in the finished project. All red was hand painted, and the abdomen was given a black wash to bring out the sculpted details. Finally, I did some minor details including some trim, feet details and wrist gauntlets in a glossy black. Overall, I am pretty happy with this Night Thrasher figure. He was fun to make, and I think he turned out pretty good (especially the head). I am hoping my customer will enjoy him and that he will fill out the ranks of the 90’s shelf in his new home. Thank you to everyone who stops by and reads these long write ups. If you have any questions regarding the process or anything please don’t hesitate to hit me up on here. My next reveal needs to remain a secret for the time being, even though he is a redo of a character I’ve already done once before. Next on the list is a custom I am making for my friend Brad Coffey as part of a figure swap so I will not be revealing it until he completes my figure. But after that, you’ll be seeing some 90’s X-Factor members to join the swarms of Multiple Man ill be buying very soon! Keep checking back for more and thanks for stopping by.